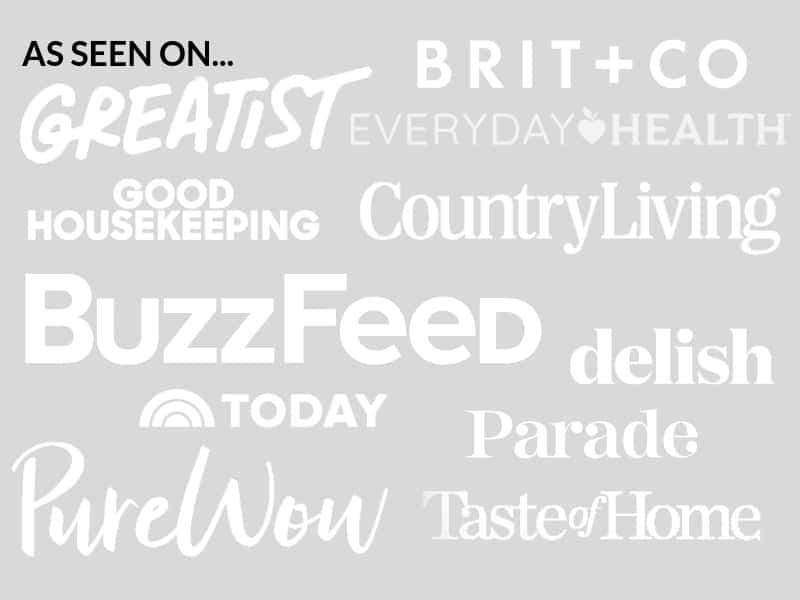 October 4, 2018 By Elizabeth Lindemann 4 Comments / This post may contain affiliate links. 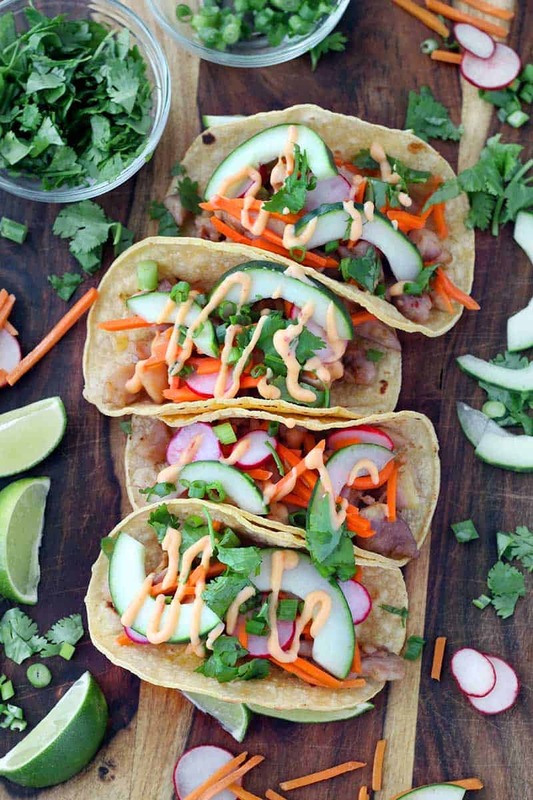 These Chicken Banh Mi Tacos are bursting with fresh Vietnamese flavor, served in taco form! It’s a match made in heaven, and it will be your new favorite mash-up recipe. Marinated chicken thigh meat is cooked until browned, then served on toasted corn tortillas with pickled carrots and radishes, a homemade spicy mayo, and cool garnishes like cucumber, cilantro, and green onion. And this gluten free recipe only takes 25 minutes to throw together (minus marinating time)! Banh mi is a wonderfully delicious Vietnamese sandwich, traditionally made with pork and served on a baguette. When I lived in New Orleans, they were often called “Vietnamese Po’ Boys.” I’d get them at least once a week for lunch. A baguette may not sound traditionally Vietnamese, and it isn’t. But the banh mi sandwich has become a popular street food in Vietnam after the baguette was introduced in the mid-19th century, when the country was part of French Indonesia (and actually, bánh mì means bread, or baguette, in Vietnamese!). Banh mi has become increasingly popular here in the United States, and you can likely find a great Vietnamese restaurant near you that serves it. Or, you can make these tacos at home! 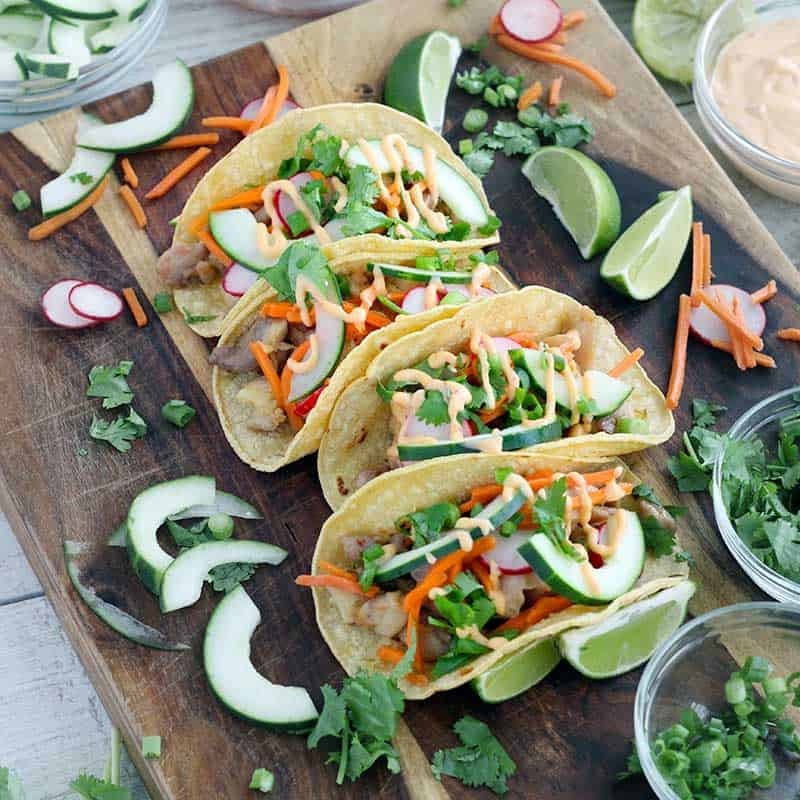 These banh mi tacos are a great gluten-free alternative to a traditional sandwich served on a baguette. They are served on toasted corn tortillas, which are also much lighter and lower carb than a baguette. First, let’s talk about the chicken. I used chicken thigh meat for this. Why? Because it’s cheaper, because it’s harder to overcook, and because I thought the texture and fat content would be more comparable to pork, which is traditionally used in banh mi sandwiches. The chicken meat is cut into 1/2 inch cubes, which means it cooks up SO fast. It only takes about 5 minutes! It’s marinated in a mixture of sugar, fish sauce, garlic, and lime juice/zest, with a little chili garlic sauce mixed in for a kick. This base is sweet, savory, fresh, and spicy – all my favorite flavors at once. No need to add salt to the marinade – the fish sauce has tons of it already. The pickled veggie mixture is a cinch to make. Traditionally, the pickled veggie mixture on banh mi sandwiches includes carrots and daikon, a mild winter radish popular in South Asia. I used regular red radishes for this, since my grocery store doesn’t have daikon. I used matchstick cut carrots (and I bought them that way from the store, which saved a lot of prep time!) and thinly sliced radishes. I mixed them with a little sugar and salt, along with some rice vinegar and water. You can leave the chicken and veggies marinating for 24 hours, or at a minimum for one hour. Just toss the veggies every so often, or shake them up if they are in a container. The spicy mayo is super easy to make as well, and can be made in advance or just before serving. And bonus: the leftovers, if there are any, are great on sandwiches! I used mayonnaise, more chili garlic sauce, and some rice vinegar to make the spicy mayo. The vinegar made it a bit thinner (perfect for spreading on tacos) and gave it a little tang. And by the way, you can use sriracha instead of chili garlic sauce in both the chicken marinade and in the spicy mayo if you prefer. Finally, please don’t be put off by the long ingredients list here. I promise this is SO easy to make, and you likely already have a bunch of this stuff in your fridge or pantry already! If you like this recipe, you’ll love these Easy Vietnamese Pork Bun Bowls. ALSO DID YOU KNOW IT’S NATIONAL TACO DAY?? 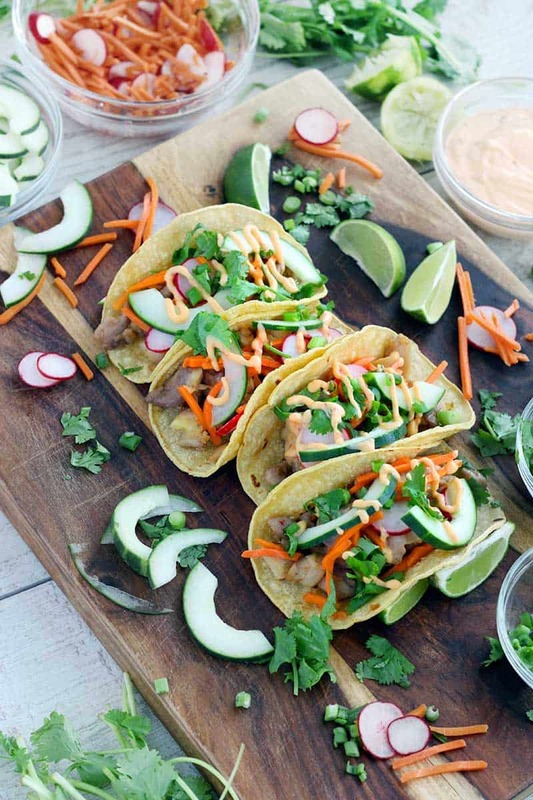 Check out some of these awesome taco recipes from some other favorite bloggers! 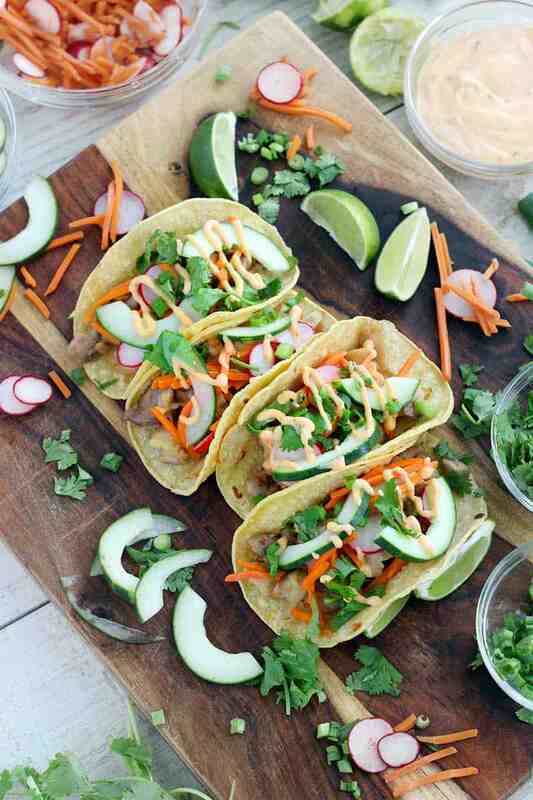 Here’s the printable recipe for Chicken Banh Mi Tacos! 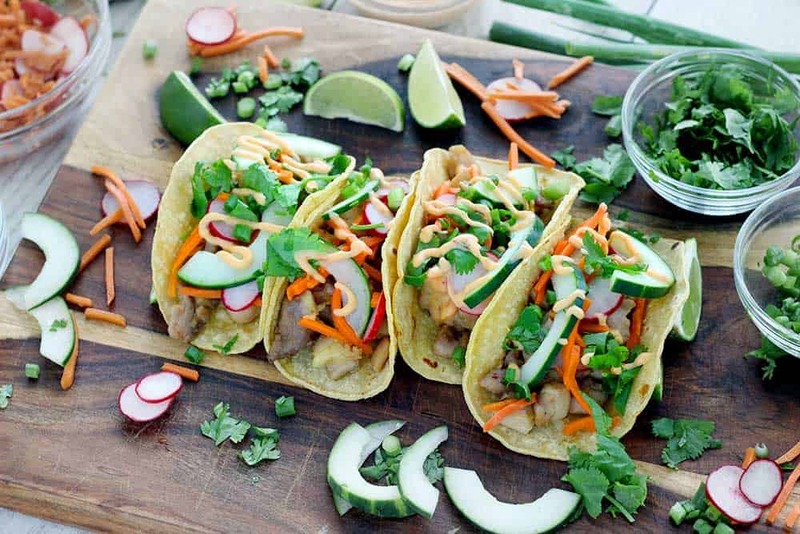 Chicken Banh Mi Tacos are bursting with fresh Vietnamese flavor. Marinated chicken thighs and pickled veggies, wrapped in toasted corn tortillas, topped with a spicy mayo and cool cucumber and herbs! This is an easy, gluten free recipe. To prepare the chicken: Mix the sugar, fish sauce, lime juice and zest, chili garlic sauce, and garlic cloves together in a medium bowl or container. Add the cubed chicken and stir to coat. Cover and refrigerate, and marinate for at least one hour (or overnight). To prepare the pickled veggies: Toss the carrots and radishes with the sugar and salt in a medium bowl or container. Pour the vinegar and water over and stir together. Cover and refrigerate for at least one hour (or overnight), stirring/shaking occasionally. To prepare the spicy mayo: mix all ingredients together. This can be done just before serving or up to 24 hours in advance. Remove chicken from marinade with a slotted spoon. Cook in a heavy skillet (such as cast iron) over medium high heat in canola oil until browned and fully cooked. 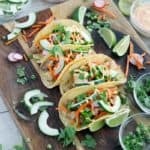 Serve tacos on toasted corn tortillas (I usually toast them in a dry skillet) layered with the chicken, pickled veggies, spicy mayo, and garnishes. 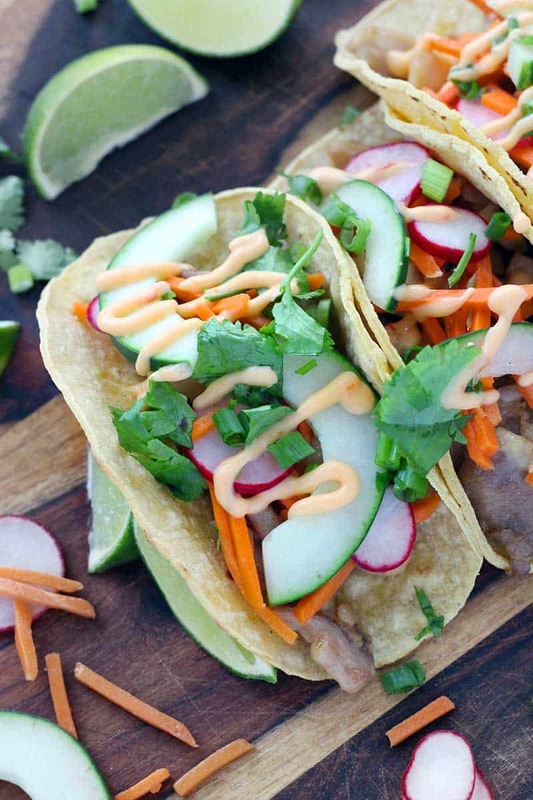 Such a fantastic, flavorful twist on tacos! Just made these for dinner. Very big hit! The flavors work well together and it’s a fun, customizable meal.